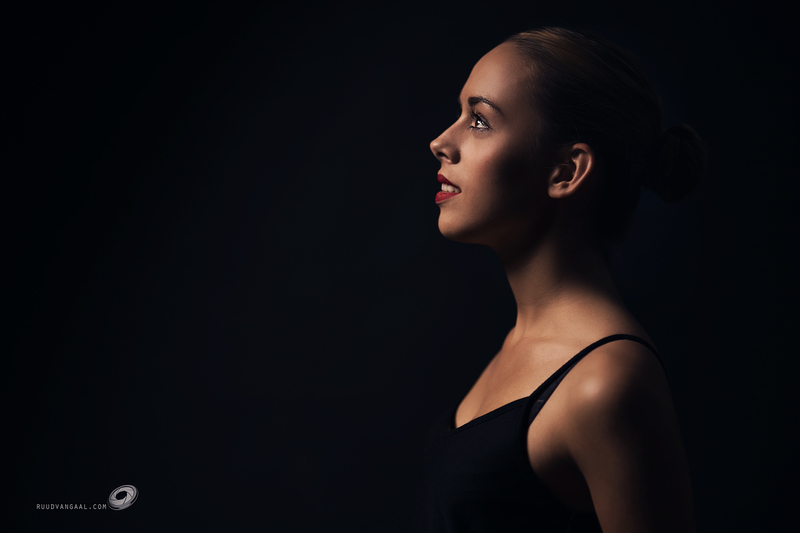 Another one from Chanelle, looking almost straight into a beauty dish, giving a somewhat theatrical look, like a ballerina about to go onstage. I shot this image about 3 weeks ago, right before a holiday, so there was no time left to select a few best ones. And it’s hard with this shoot, there are so many beautiful images of Chanelle. Here is a first one. Just about all shots I did in this shoot was on a silky Sigma 85mm f/1.4 lens on a Canon EOS 6D, mostly with a diaphragm of around f/1.8-f/2.0. I just bought a new light-gray background and used a single large round softbox here. I often use Canon’s 24-70 f/2.8 L lens for studio work, but I had enough working space to use the slightly longer lens, which is a little more flattering perspective-wise, and the bokeh is softer. But that’s not the object of the photo of course; it’s Renilde, sitting gracefully with beautiful muscle toning.